A group of St. Joseph's University students were victims to a home invasion that happened a couple of blocks away from the University. The incident happened on Wednesday at 5 am on the 5600 block of Woodbine Avenue. Police say two armed men broke into the house, one had a knife and the other had a gun. One of the students heard the break in and saw the men breaking in. They grabbed the girl, duct-taped her mouth, zip-tied their hands and threw her in a closet. After robbing the house, the suspects took the girl outside and opened the trunk of her car, but before they could get her in, the girl escaped, ran back into the house waking up her roommates who called the police. The suspects were able to get away with an iPad, aniPhone, and a wallet, as well as the victim's car. Two people have been killed and one firefighter has been injured after a house fire erupted in the early hours of Wednesday morning in the Bustleton section of Philadelphia. The blaze happened on the 9800 block of Bridle Road, where firefighters arrived to find the first and second floor of a family home engulfed in flames. The fire took a total of 35 minutes to get under control. A man and a woman were found on the first floor and were rushed to the hospital but neither survived. One firefighter was injured in the house and was taken to a local hospital for evaluation. The cause of the fire is still under investigation. 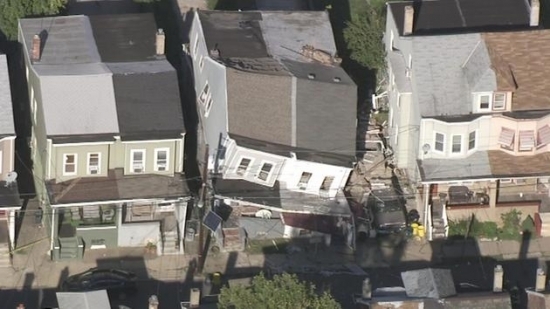 Emergency crews were on the scene Wednesday after they received a call of a partial house collapse in Trenton, New Jersey. The collapse happened at around 3:15 on the unit block of Wayne Avenue. Authorities say that the collapse was caused by a natural gas explosion, which brought down part of the house, as well as damaging several other homes on the block. Two people were taken from the damaged homes and sent to the hospital for treatment. The whole block had to be evacuated due to the damage. Tonight, Clear and cool, with a low of 52 degrees in Center City.